We have everything you need in matter of fastening A2 and A4 stainless steel products. We can provide you with high quality screw elements, nuts, rivets and all other stainless and acid-proof equipment. You can find our offer below, there are links to our polish site with full catalog. Thank you for your interest in our offer. You are invited to cooperation. 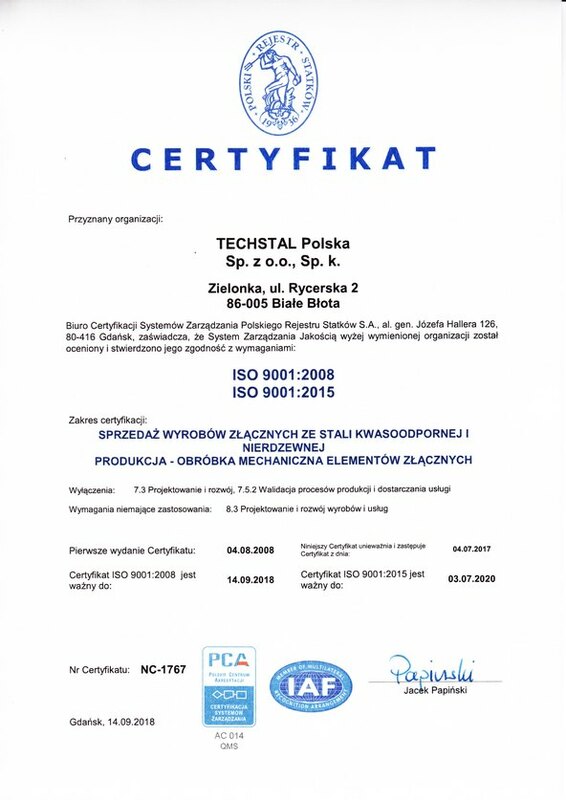 TECHSTAL has documented, implemented and maintained the quality management system, which is in accordance with the requirements of the international ISO 9001:2008 norm; furthermore, the company gives an evidence of its involvement taking care of the system’s constant improvement. TECHSTAL has established the quality policy as one of the most important elements of management, in which the employees’ actions aim at providing services, as well as, acid-proof and stainless steel products on the market for industrial plants and merchant houses that meet clients’ requirements and current regulations. The elements associated with TECHSTAL are acceptance of quality of products and service on the market, meeting clients’ requirements, and professionalism. The quality policy of TECHSTAL is periodically reviewed with regard to its constant usefulness. TECHSTAL owners assure that the quality policy is announced, comprehensible and maintained in the whole organization; moreover, they assure of tools to implement this policy. With the help of the above form you are able to send an inquiry concerning our offer or any other matter connected to the information published on our website.